1Heat oven to 325°F. In a large mixing bowl, beat together brown sugar, butter, molasses, egg, and Cinnamon KISS using an electric blender on medium speed (or mix until well moistened with wooden spoon). 2In a separate bowl, whisk together flour, baking powder, ginger, cinnamon, cloves, and salt. To create cookie dough, add ½ of the dry mixture at a time to the molasses mixture, stirring well after each addition until thoroughly blended. 3Shape dough by rounded tablespoons into 2" balls. Place on ungreased cookie sheet, leaving about 2" of separation as cookies will expand. Bake 13 minutes or just until set. Cookies will appear slightly under-cooked once removed from the oven; do not overbake or they will become dry rather than chewy. Remove immediately from cookie sheet and place on cooling rack. 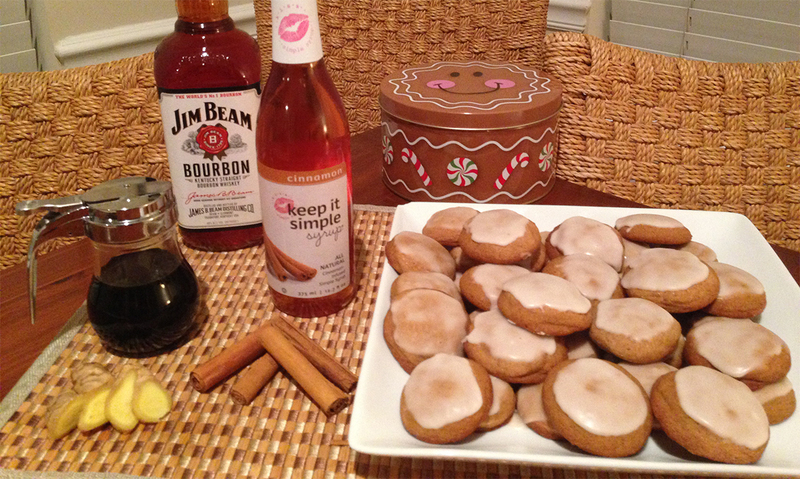 4While the cookies cool, make the glaze by stirring together the confectioner’s sugar, whiskey, and Cinnamon KISS. Lightly dip the top of each cooled cookie into the glaze and then turn upright before returning to the cooling rack, allowing glaze to dry. 5Yield: About 2 dozen cookies.